Good Morning my dear readers…..and even though green bean casserole remains a favorite on many a Thanksgiving Table (personally, I happen to like it)….this recipe gives us choices. Which usually means healthy, right? So do you need a colorful, green colored, substitute side dish for your Thanksgiving table? Then, I’ve got a winner for you. Thanksgiving is getting close….and you really don’t have to wait to make this recipe. It is simple and delicious. You are probably saying …ok already! What is this green veggie? Now, if you are like my kids who turn their noses up at these little cabbages….you really don’t know what you are missing. I have paired it with a Chorizo sausage that I learned to cook with while living in New Mexico. 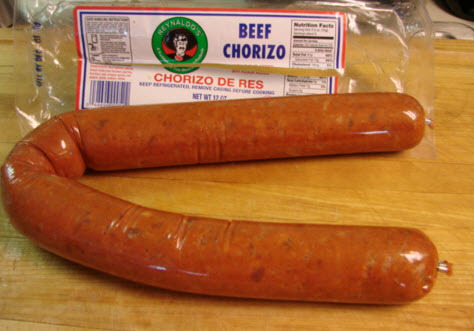 You can find Chorizo in your supermarket, usually where the summer sausages are located. If it has a casing, just remove and slice. I have often thought Chorizo could be used to tie-dye t-shirts, because of the reddish/brown oils it emits when cooking! 🙂 Ok, maybe that is an extreme, but a small price to pay for flavor. Years ago, when I first started cooking with Chorizo…I made scrambled eggs and Chorizo ….and my pretty, bright yellow eggs looked like they had been mudied in a mud wallowing hole. If you drain and blot dry, the Chorizo is choice! Sometimes, whole sprouts can be a challenge to eat, moving around one’s plate as you chase it with a fork. 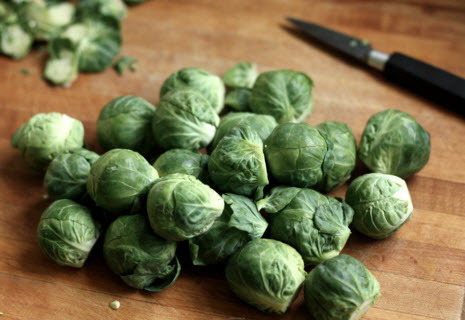 So one neat trick is to sort-of peel back quite a few of the leaves of the Brussels Sprouts ….and you can leave some of the little cabbages halved or whole. The leaves give a different texture, than eating the little cabbages whole, which my kids have said… sometimes taste a little bitter. I added in a little onion and a small amount of cayenne pepper to give it the sprouts a little more zip, and this becomes quite a tasty dish as the sprouts are stir fried with a bit of caramelization…which is always good in my book. Yes, Chorizo can be a bit spicy. So if you are not “into” spicier foods, but prefer “less spicy”, use Chorizo sparingly…it adds great flavor to the little sprouts….and you can omit the cayenne pepper, if desired. If you are a veggie lover…especially a green veggie lover, like me… and you want to switch up the green bean casserole for something different for Thanksgiving or even for Christmas dinner…the colors are perfect and you must try this dish! It is one of my favorites was to eat these cute little cabbage halves! Have a great Tuesday and keep warm if you live in the cooler climates. Have a cuppa something warm….I am enjoying my cuppa hot green tea! 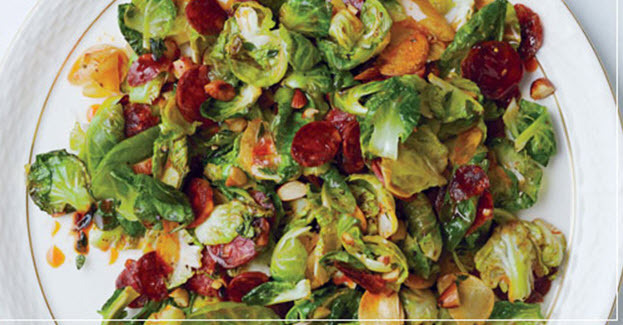 Brussels Sprouts and Chorizo make a colorful side dish and it just so happens that it tastes good too. I especially love the caramelization that occurs when stir frying the leaves and halves of these little cabbages. Yummy! Heat the Chorizo slices in the same skillet over medium heat for about 5 minutes or until the Chorizo gets a little crisp. Remove crisped Chorizo to a small bowl lined in paper towels to remove excess oils. Using a different skillet, (or wiping clean existing skillet)*...add olive oil and heat over medium heat. Slowly add in the leaves and halved Brussels Sprouts, stirring as if stir frying, being sure to get a little browning on each leaf and sprout. Sprinkle with cayenne pepper. Cook for about 10 minutes or until the sprouts are tender. Place sprouts in a bowl and top with the red wine vinegar, toasted almonds, and crisped Chorizo At this point you may serve by tossing ingredients or wait until you are at the table and toss, much like a salad. Halving the sprouts allows for more penetration of flavors as well as allowing one to not have to chase a sprout all over one's plate! 😉 You can leave some of the sprout halves with leaves intact while removing the leaves completely from others. *Be sure to drain Chorizo and blot dry with paper towels. If you are using the same skillet that you crisped the Chorizo.... make sure you thouroughly wipe out the skillet with paper towels (or wash skillet) before putting in the sprouts. Chorizo tends to have a reddish/brown residue that will transfer over to your sprouts....and they won't be that pretty green. 😉 This is the same principal when cooking Chorizo with eggs. « Salt Of The Earth! LOL You have finally put a recipe up that hubby will like. He loves spicy, and he like Brussels sprouts, which I don’t particularly care for. Brussell Sprouts are one of my favorite vegetables. Looked for some here the other day at Paesano’s and they were the size of acorns, way too tiney for my taste. We usually saute them halved in olive oil with garlic. glad to provide a variation….I know there are frozen sprouts but they just aren’t the same thing, are they? I like them in olive oil and garlic too! I was watching a gardening show….I think it was from the United Kingdom and they planted what they thought were Brussels Sprouts and out of the 12 seedlings, only 2 were the real thing. The others were crosses between Kale and Broccoli believe it or not. Personally, I have never tried to grow the sprouts but I sure love growing potatoes, carrots, lettuce, cabbages, sweet corn, bell peppers, cucumbers, green beans, tomatoes, green chilies, onions and herbs of all kinds. Enough to always have the makins’ for salsa! haha! oooh the brussel sprout debate… It divides a nation here in the UK as it is seen as an evil associated with the much loved Christmas dinner by some especially as they have unfortunate side effects… It even makes an unwanted guest appearance in the Sky TV Christmas TV ad..
Latest news is that you shouldn’t score the base of the sprout – we were brought up to score a large cross in the base to shorten the cooking time… however the TV chefs now say that makes them more mushy… yuk! However the latest and greatest to be found in the Christmas freezer is “Luxury Sprouts with Chestnuts, Bacon, Stilton and Gorgonzola” would sounds a bit rich for a side dish.. but a great alternative for a vegetarian eh! I don’t have to worry this year… my sister is doing the Christmas dinner and that is definitely a win in my book.